Students from Caesar Rodney High School will present “Independence or the Bayonet” – The Life and Times of Caesar Rodney” in an historical theater presentation. DOVER – DNREC’s First State Heritage Park, in partnership with Caesar Rodney High School’s Stage Crew and Thespians, will present a historical theater production for the First State Heritage Park’s monthly “First Saturday in the First State.” A variety of other free events and activities will also be featured throughout the day. One of Delaware’s greatest heroes, Caesar Rodney did much more than simply ride to Philadelphia to cast his vote for American independence. 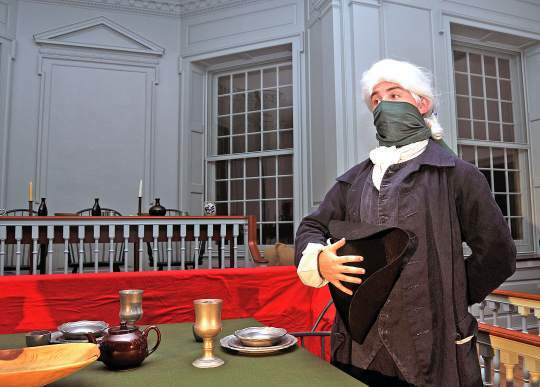 Under the glow of candlelight in The Old State House, step back in time to experience the life of the patriot who devoted his life to the service of his beloved Delaware. Caesar Rodney High School students will perform the historical theater piece under the direction of CRHS theater teacher John Muller. “Independence or the Bayonet – the Life and Times of Caesar Rodney,” will be presented at The Old State House at 11 a.m., 1, 3 and 5 p.m. on Saturday, Oct. 6. Performances are roughly 45 minutes long. Tickets are free, but space is limited, so reservations are recommended by calling 302-739-9194. This production is a part of a four-play series, presented in rotation each year in October. This successful partnership has been in place for five years, and has provided an exceptional student opportunity. Other programs during the day on First Saturday will further emphasize the importance of Caesar Rodney to Delaware. Visit Caesar Rodney Headquarters at the John Bell House to learn about the many contributions he made to the First State during his lifetime, or go on a walking tour featuring Dover’s other heroes of the revolution. Learn about all of the places in Delaware that are connected to Delaware’s hero, Caesar Rodney, and explore his life as you prepare for the “Independence or the Bayonet” historical theater presentation. Tour Delaware’s state capital building, and experience Delaware history. Photo ID is required for all adults entering the building. In 1911, the Victor Talking Machine Company started its education department. The mission was to take music appreciation courses to rural schools and standardize music education. Learn more about the department and its mission. Dover was a hotbed of activity during the struggle for American Independence. Tours begin on the half hour. Get down and dirty with state park archeologists, and take part in an actual archaeological dig. Experience the thrill of discovery as you uncover small pieces of Dover’s past. For ages 10 and older. Weather permitting. This program will highlight some of the cost-effective steps every home archivist can take to preserve precious family records. 11 a.m., 1 p.m., 3 p.m. and 5 p.m. Step back in time to experience the life of the patriot who devoted his life to the service of his beloved Delaware. Space is limited and pre-registration is recommended by calling 302-739-9194. Presented in partnership with Caesar Rodney Stage Crew and Thespians. Do you have a Biggs Kid who loves birds? Join a Delaware Nature Society Teacher/Naturalist for “Bird Watching Basics,” to learn the traits of a bird, how to use binoculars, and tips for beginners in the great outdoors on The Green and Legislative Mall. From the 1690s to the present, find out how this site went from a courthouse to a hotel and back again.